Our story begins in China during 1611 when our first known TRAN family ancestor was born in the village of Ngoc-chau-thuong of the district of Long Khê, in the province of Fujian. The Middle Kingdom, or China, was then governed by the Ming emperor Wanli (1573 – 1620). Aside from being a region where coastal trade and merchant businesses flourished, Fujian, during the Ming dynasty, was also a centre of publication producing a mass volume of books including almanacs, novels, joke books and law or moral guides 1. This was not a happy time for our first known Chinese ancestor. It was characterised by high taxes incurred mostly by the farmers who were themselves overseen by landlords1. Inflation had risen to ridiculous levels, with the mode of currency changing several times since the inception of the Ming dynasty by emperor Hungwu (1328 - 1398). The Ming emperors were beginning to incur the consequences of their extravagant living. 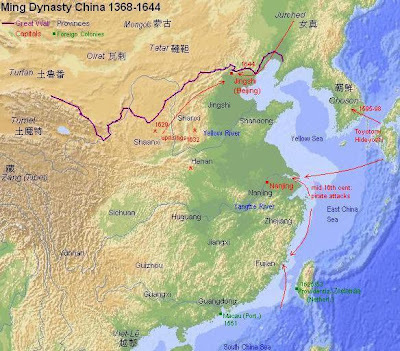 The Ming army was no longer agriculturally self-sufficient as Hungwu had originally intended centuries ago so as to relieve the burden from the peasant population. The empire was in dire financial deficit: its treasury was empty. Even government food relief had to be sourced from philantropists or wealthy merchants who were often ordered to alleviate the plight of starving peasants 2. This was a far cry from wealthy times when the humane Zhu Gaozhi (1378 - 1426) was generously dispensing aid to the people and scolding his ministers for not acting more promptly during a famine. During the period 1621-1637, ancestor Tran-Duong-Thuan would have witnessed a political crisis involving the Ming eunuchs. It originated from a craftsmen uprising following yet another brutal increase in commercial taxes by the governing eunuchs. In 1627, these uprisings were followed by important insurrections in the Northeast of the country because the armies were finding it difficult to meet refurbishment requirements after their budget had been decreased. To make matters worse, the disatisfied peasants soon joined the uprisings which continued right up until the end of the Ming dynasty. In the meantime, the Jurchen tribes had begun their invasion of China from the Northeast. According to Brook 2, the population in this period had grown to a level far exceeding that of any Ming period. This caused additional pressure on resources. Brook explains that from 1580 onwards, there were recurring floods, droughts and cold cycles. For example when Tran-Duong-Thuan was 26 years old, he would have heard of the famine in Jiangxi, a province to the west of Fujian, where people were so hungry that they were driven to filling their stomachs with soil dug deep from the ground. This then was the state of the Middle Kingdom when our our ancestor Tran-Duong-Thuan reached 30. To protect himself from the often bloody conflicts which accompanied the revolts and political uprisings, Tran-Duong-Thuan began to seriously consider leaving his natal province to regain the Dai-Viet (eventually Vietnam). In particular, he contemplated settling in the south, in the Thừa Thiên province. Once there, he hoped that the local authorities would recognise him as a political refugee. In 1643, his wife whose name, date of birth and death remain unknown to us, had born him a son which they named Tran Tong. And then the worse came. It was obligatory for all males to shave their heads and grow a long plait, following Manchurian custom. It was obligatory for all men and women to wear the Qing clothing. This was ironic since the Jurchens themselves had been sinicised by the Ming emperor, Yong Le centuries before. And now, in a cruel twist, they were imposing their custom to the Chinese. Being stripped of his national identity and personal dignity would have taken its toll on Tran-Duong-Thuan. He decided that he would not submit to the Manchus and would remain loyal to the Ming. Soon after these new rules were imposed, he made a decision. He would leave China. Sadly, he did not take his wife and child with him. She remained behind to take care of her mother. But what was a woman’s worth in those days anyway? When Tran-Duong-Thuan arrived in the Dai-Viet, it was ruled by emperor Le-Thanh-Tong of the Le dynasty. While the emperor reigned as figurehead, authority was detained by the Trinh lords in the North and the Nguyen lords in the South. Not long after his installation in the Thừa Thiên province, Duong-Thuan took a second wife. She was a Vietnamese woman from the village of Su-lo-ha. As these were not recorded, we do not know her name, birth date or the date of her death. However she should not be confused with a purchased concubine. She was a legitimate second wife. In the meantime, Duong-Thuan’s son Tran-Tong had joined him in the Dai-Viet. Later, he and his wife had a son, his second, which they named Tran-Hong. Duong-Thuan died at age 79 on 12 April 1688. He had remained loyal all his life to the Ming form of dress. He gained posterity under the cult name “Thi-To”. His mortal remains were buried on the slope of a hill in the hamlet of Tu-tay, in the village of An-cuu of the district of Huong-thuy of the Thu-thien province. 1 Chan, Albert. The Glory and Fall of the Ming Dynasty. University of Oklahoma Press, Hong Kong, 1982. 2 Brook, Timothy. The Confusions of Pleasure: Commerce and Culture in Ming China, University of California Press, 1999. Emperor Lê Thánh Thông ruled Đai Việt from 1460 to 1497 long before Trân Dưỡng Thuẩn arrived in Đại Việt (probably in 1650). At that time The Đai Viêt was ruled by emperor Lê Thần Tông (second term from 1469 to 1662). It is easy to mispell the two king names. Comment by Lê Bá Quang, son of Madame Tran Thi Nhu Chuong, first daughter of Mr Trẩn Trứ, who was elder brother of Mr. Trẩn Thước. As such I was a nephew of Madame Phương Lan. I had met her for some time in Huế when I was young.